I was leafing through a few older books (meaning 2013 in this case...not exactly OLD), looking for a quick and easy piece of jewelry I could make for a friend. 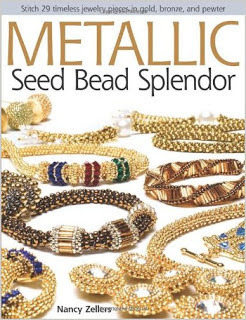 I came across a bracelet designed by Nancy Zellers in her book Metallic Seed Bead Splendor (review at the link and link to purchase). It's a super cute bracelet that she calls "Going Baroque with Pearls". I didn't have the right size and shape of pearls, but I found with just a few adjustments, I could use 8mm faceted fire polished beads. 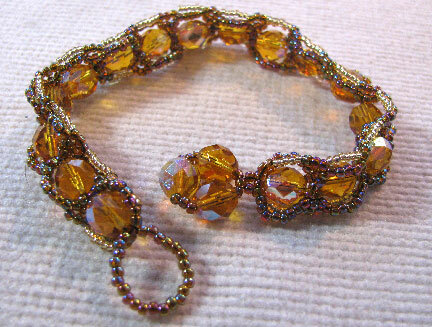 With some 8mm accent beads and two different colors of seed beads in size 11/0 and one in size 15/0, I made this bracelet in one afternoon. It's a modified and embellished daisy chain stitch, and I kept my tension tighter than Nancy did so that my bracelet would twist a bit since my friend has a narrow wrist. You could also leave a link or two out...or add more if you need them.